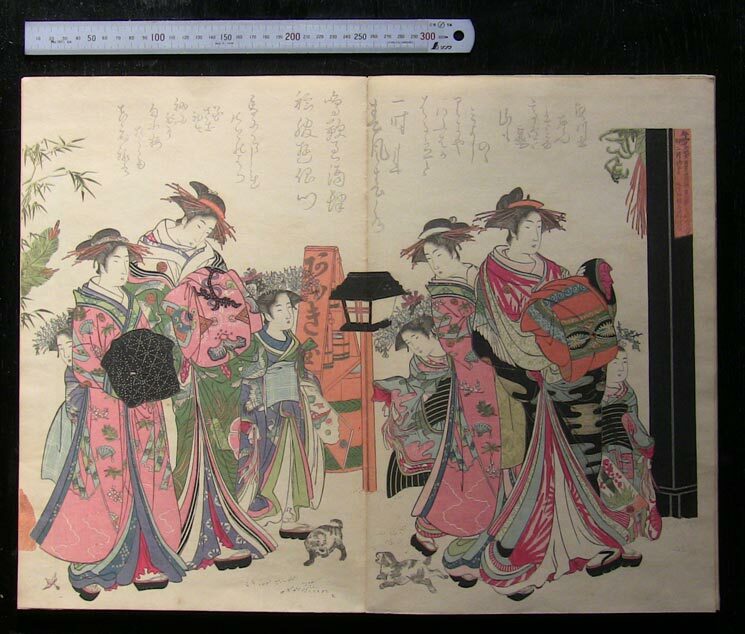 Woodblock RoundTable: Christmas in January! Five or six times a year, I find in my mailbox an envelope with a thick catalogue inside. This is from one or another of the print and oldbook dealers downtown. Some years back, during the years when I was making the very popular poetry series, and had money 'to spare', I was a regular customer of those shops, but in recent years the number of catalogues arriving in my postbox has tapered off, as they have one-by-one dropped me from their mailing lists! One such catalogue arrived here a couple of weeks ago, and this one is a little bit different from that issued by other companies. Most of the catalogues are simply that, catalogues. The items are listed with a price, and whichever customer calls up to order any particular item first, can have it. Because these are old items, there are of course no other copies available; everything is a 'one off'. But this particular company doesn't sell things that way; they send out the catalogue - which has a price listed for each item - then take orders for the next ten days, letting them build up, including multiple orders for the same items. But it's not what you think - they are not taking bids on the items. At the end of the ten days, they simply draw straws on each one, and if your name comes up, you get the item - at the catalogue price. I never really had much luck with their stuff. Desirable items of course always draw many offers, so the chances of getting a 'hot' item are pretty small. But I browsed through this catalogue anyway, seeing what treasures might be in there. And this year, there were so many! There were easily more than a dozen items that I would love to have as part of my collection here. So I couldn't help but think ... "Dave, you had a very good Gift season in December. You worked so hard ... Surely it's OK if you put your name down for just one of these items, isn't it?" Well, it didn't take much to talk myself into it. I called up the girl who takes the orders, and put my name down for something that I have lusted after looked at from afar for many years - a fine copy of the Taisho-era reproduction of the famous Masanobu album Yoshiwara keisei shin bijin awase jihitsu kagami (A Mirror Comparing the Calligraphy of New and Beautiful Yoshiwara Courtesans). 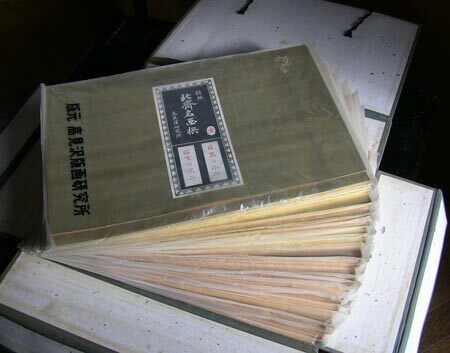 The Edo period original version is of course museum material, and even single pages from it go at auction for around $5,000. 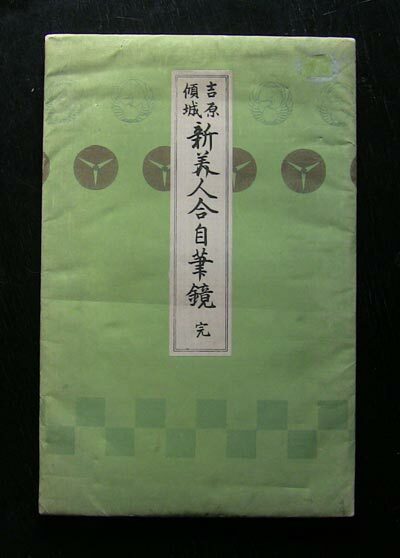 This Taisho period reproduction of the album was listed at 35,000 yen (just under $400). She took down my name, along with the item number, and then asked "And ....?" And I couldn't help myself; I added one more, a boxed set of 50 prints based on Hokusai designs, which was issued by the Takamizawa company in the pre-war period. These are usually found all split apart and in poor condition, but this was listed as being complete, and in 'very fine' condition. It was 49,000 yen (just over $500), but as I 'knew' that I would only win one of these items, if that, I wasn't worried. That was a couple of weeks ago, and I basically put it out of my mind, being busy (very busy!) with the current print project. This morning, I was interrupted in my proof printing by the doorbell; a package delivery. As I said ... Christmas in January! Both items were in the box! It's funny, but the first emotion was a bit of a rush of guilt! My collectors have been supporting me so well recently, many of them perhaps because they want to help this guy 'get by' in his projects, and here I go and start throwing money around like this! But please ... just have a look! 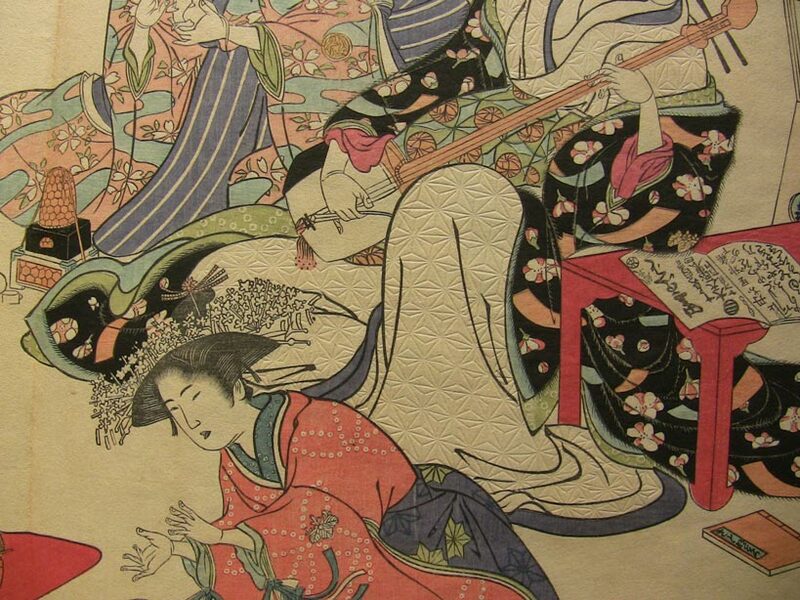 The Masanobu album. Padded cover, all printed in woodblock, of course. Each spread represents a Yoshiwara scene, accompanied by calligraphy from the ladies depicted (these were real people, and it's probably better if you don't ask what their line of work was ...). There are seven such spreads in this album. And to think that they would let this go for just around $400 ... incredible! Anyway, it has now found a very good home for the next couple of few decades, I think! 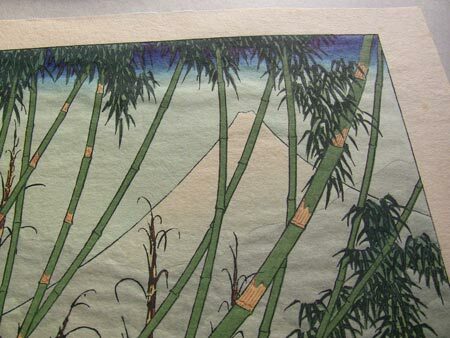 Takamizawa prints vary widely in quality, but these are very nicely printed - with clean, unspotted gradations, smooth colour, and perfect registration. Here's a closeup (enlargeable). Nice stuff! The top few packets in the set have been opened a number of times, and they show a bit of wear and tear, but when you look down into the pile, it's clear that most of these things have never been disturbed. A set like this is very difficult to 'browse' and I'm sure very few of these prints have ever seen the light of day. And that's going to have to change. The backboards and cover sheets for the prints are a very cheap pressboard, and the prints are already showing signs of 'burn' from the acidic pulp. I really don't want to 'destroy' this item, but those prints are going to have to come out of there, or they'll be doomed. Enough of this playing around though ... I have proofing work to do! I have an appointment to see Kaori-chan tomorrow evening (all the way over at her place on the other side of the metropolis ...) and I don't have anything to show her yet! You are forgiven, my son . . . recite 3 or 4 mantras and have a warm bowl of chicken soup already . . . just keep the soup away from the prints. If you can't recognize quality and craftsmanship when you see it and touch it, I doubt it would find its way into your own work and consciousness. Enjoy the prints, Dave, and best regards. I am very happy to have supported you purchase (in my very small way). Who needs food. Who needs shelter. Some things just mean more and there is nothing wrong with that. ENJOY! 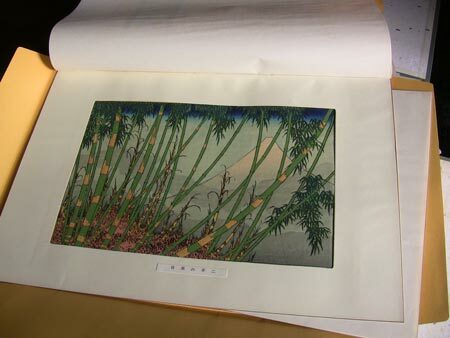 I'm very thankful to have picked up a bit of Moku Hanga over the internet via your efforts and VERY thankful to be able to afford a collection of your "Mystique" series. I treated myself to a collection of prints from my sensi. You should be able to "treat yourself" to a collection from yours. If you can't justify that, view it as a "studio tool" purchase. I went to a show at the University of Virginia Art Museum called "The Moon has no Home" displaying a collection of Japanese Woodblock Prints and could've stayed for days studying and enjoying the prints. I marveled at the beautiful lines, crisp colors, and clever registration and also recognized brush strokes and baren marks. I know the craftsmen were long dead but seeing those works was almost like meeting them in the flesh and I get the same experience when I get a piece of art in the mail that I've purchased. You received a thing of beauty that another human has poured their soul into and now that vessel will stay with you until it is passed on to speak for the craftsman long after they are gone. I can think of no better place for those works than residing in the care of one who knows how to care for them and also reveres them at the same time. What a boon for you that you scored both! Thanks too for that shot of the bamboo print. What a treat! It must've been spring because I see the shoots rising aggressively in the background and I like that the artist rendered in the takenokawa husk rings on the stalks. Thanks again, Dave! If anyone deserved to have beautiful images it is you, I cannot think of anyone who will appreciate them more. And part of living is doing this, appreciating. You cannot work all the time so no guilt is needed at all! My best to you, be inspired! 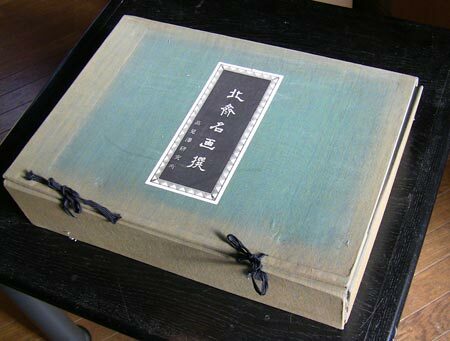 I know about the guilt - a handful of years ago, I found and purchased a complete 1930s reproduction of Hiroshige's 53 Stations of the Tokaido (the original Hoeido set). The dealer had decided to keep the set together, rather than break it up and sell the individual prints on eBay. It was a rare opportunity, I had the money, I went for it. I had a pang of guilt, which passed almost as fast as it took me to think, "That just cost me more than a round-trip airfare to Tokyo!" Buyer's remorse is nature's way of reminding us that we can't spend that kind of money any ol' time. But in the words of the philosopher Alfred P. Doolittle, "With a little bit of luck, when temptation comes you'll give right in!" Thank you for the beautiful snapshots. I hope you will make "David's Choice 2". But until the eBook world settles down a bit and decides on a format for presenting multi-media across platforms and devices, I can't justify building any more of those. The one I made works on 'some' desktop computers, won't work on the iPad, and who knows what sort of thing is going to run on the new Android tablets coming out soon ... No; it's better if I wait a bit. A well deserved treat I'd say! Congratulations on buying such beautiful things! I don't think any of us begrudge you those purchases... rather, we're all jealous!